Smith had his eyes opened to the birds and the bees in Colorado, but it was airplanes that caught his adolescent interest. “My boyhood heroes were Charles Lindbergh and Howard Hughes,” he says. Hughes, in fact, had grown up in the neighborhood, in a stately red brick house that is now part of the campus of the University of St. Thomas in Montrose. In 1933 Smith’s banker father, Frank Chesley Smith Sr., was named president of Houston Natural Gas, a company founded in 1925 to deliver natural gas to Houston homes, businesses, and industries, one of the first in a highly competitive era when fuel supplies were shifting from coal and oil to abundant natural gas, previously considered a waste product. The highly respected Smith Sr. served as president until 1955, helping to usher in the widespread use of natural gas appliances, then as chairman until 1967, and honorary chairman until his death in 1971. The company became one of the premier integrated natural gas companies in the United States, owning both the gas and the pipelines that delivered it. Houston Natural Gas would later become Enron. On weekends Frank Sr. took young Frank sailing and fishing on Galveston Bay. Frank Jr. liked sailing but he didn’t much care for fishing. Sailing, however, would remain a lifelong passion. But he also loved airplanes—so much so that in 1936, when he was fifteen, he designed a model airplane that won the city junior model airplane championship and then shortly thereafter the state junior model airplane championship. His trophy was displayed in the window of the W.C. Munn Dry Goods store in downtown Houston. After three years of liberal arts at Williams, Smith crossed the continent, transferring to the California Institute of Technology in Pasadena, graduating in February 1944 with a degree in aeronautical engineering and an honor key from the Associated Student Body for his work as editor of the newspaper. “Somehow, I managed to graduate,” says Smith. But there was a war on, and Smith enlisted in the Navy, hoping to go to Officer’s Candidate School. He couldn’t pass the eye test. His vision was 12/20. Back in Texas Smith did indeed make his living out of electronics. For many years he worked as a manufacturer’s consultant, often flying around the country in his single-engine Mooney, having obtained his pilot’s license in 1960. A favorite part of these cross-country trips, he recalls, was flying his small plane over the 14,411-foot ice-covered peak of Mt. Rainer, an active volcano in the Cascade mountains of Washington state. By the early Sixties he was married with three sons and living in a small subdivision called Riverbend on winding Buffalo Bayou in Hunters Creek Village on the west side of Houston. The house was designed by Harwood Taylor, one of Houston’s foremost modern architects. (Smith sketched out the floor plan.) It was the first of several houses Smith helped design, including on the bay in Kemah a cabana patterned after a plan for a Texas farm house by his friend O’Neil Ford, a leading practitioner and advocate of Texas vernacular architecture. In Colorado he designed and built a 100-foot “long barn” based on a house in England where his hero Charles Lindbergh had lived with his wife. The conversation marked the beginning of Smith’s long and deep involvement with environmental issues in Texas and a lifelong friendship and collaboration with Terry Hershey. Terry Hershey and Frank Smith were certainly not the first environmentalists in a city fairly hostile to conserving nature or public land, or to any sort of planning. In 1923 Joseph Heiser, an accountant for Texaco and son of the city’s first parks superintendent, founded the Outdoor Nature Club and spearheaded preservation of the 655-acre Little Thicket Sanctuary in what later became Sam Houston National Forest in East Texas. Heiser was known as the “John Muir” of Houston. For an excellent environmental history of the region, the entire book, Energy Metropolis: An Environmental History of Houston and Gulf Coast, is available online. Heiser was supported in these early efforts by the members of Houston garden clubs: the Garden Club of Houston, founded in 1924, and the River Oaks Garden Club, founded in 1927. The latter occupies the building that had been the headquarters of the Forum of Civics founded by developer Will Hogg to promote the benefits of nature and public spaces within the city. Hogg also provided trees and plants for public areas, a project that was taken up again by citizen volunteers in 1983 when they founded Trees for Houston. The Hogg Family, including Ima Hogg, made possible Memorial Park and the Hogg Bird Sanctuary, both of which the Hoggs intended to remain as natural as possible. In 1929 a group of Houstonians formed the Buffalo Bayou Preservation Association to investigate work done by the Army Corps of Engineers on Buffalo Bayou. But little is known of the group’s activities, says Dr. Teresa Tomkins-Walsh, archivist with the Houston History Archives at the University of Houston. In 1959 members of the Outdoor Nature Club, including Armand Yramategui and Sarah and Army Emmott, organized a committee, Texas Beaches Unlimited (TBU), specifically to fight for public access to Texas beaches. The members of the TBU did legal research, wrote letters, and convinced Texas Representative Bob Eckhardt of Houston to propose the Texas Open Beaches Act. With the assistance of legendary Texas politician A. R. “Babe” Schwartz of Galveston, the state legislature passed the law on July 16, 1959, the first such law in the country. Army Emmott, who owned a bookbinding business, was the son of Catherine Emmott, who was instrumental in persuading the Hoggs and the City of Houston to create Memorial Park. The line used by Save Buffalo Bayou on our website homepage, “A ribbon of life through the concrete of Houston,” is a quote from Army Emmott, whom Smith describes as a “great friend.” The Emmott family lived in the Camp Logan neighborhood, near what would become Memorial Park, and Sarah Emmott wrote a book about the history of the park called Memorial Park: A Priceless Legacy. Yramategui, a Rice engineering graduate and the son of Mexican immigrants (his father was a machinist for the Southern Pacific Railroad), would eventually become curator of the Burke Baker Planetarium at the Houston Museum of Natural Science and a founder of the Houston chapter of the Audubon Society. A devoted naturalist, he transformed the TBU committee into the Texas Conservation Council and became its first president. Up until that rainy afternoon on the bay in 1966 Smith was busy making a living, when he wasn’t sailing or flying his plane, and was not actively involved in environmental issues. But after that conversation with Terry Hershey, Smith joined with her and oilman George Mitchell, who also lived on the bayou, to fight against plans, already funded and in the works, to strip, reroute and channelize with concrete Buffalo Bayou west of Shepherd Drive through the Memorial area all they way to Addicks and Barker dams. Homeowners in the neighborhood concerned about the felling of trees and bulldozing on the bayou already under way had formed a new Buffalo Bayou Preservation Association, and Hershey had become its most ardent activist. Mitchell became president, and the group enlisted garden club members, activists Hana Ginzbarg and Sadie Gwin Blackburn, businessman conservationist and politician Albert Fay, also a pilot and sailor who lived on the bayou, Fay’s brother Ernie, who lived next door on the bayou, and many others to their cause. Hershey flew to Washington to testify before Congress at the invitation of Representative George H.W. Bush of Houston, who convinced the Corps to “restudy” the issue. The channelization of Buffalo Bayou, a joint project of the Corps and the Harris County Flood Control District, was dropped. Frank Smith Jr., Rep. George H.W. Bush, and Albert Fay c. 1967 in Fay’s home on the north bank of Buffalo Bayou near Post Oak Road. Smith became the second president of the BPA. He would serve on the executive committee for nearly fifty years until a parting of the ways over the BPA’s promotion of a plan to raze, dredge, channelize and reroute one of the last natural stretches of Buffalo Bayou as it flows past Memorial Park and the Hogg Bird Sanctuary. His good friend, the late environmentalist and “river man” Don Greene, a former president of the BPA, had already resigned from the board over its changing focus. Some six months after Smith’s editorial was published, in the spring of 2015, Smith was removed without notice from the executive committee of the organization he had helped found. Her “committee” was “all pretty big shot businessmen and lawyers with lots of money and big hearts.” In addition to her highly successful husband, Jake, the Fay brothers, and Mitchell, Hershey’s “committee” included businessman Tom Shartle and lawyer Thad Hutcheson. Hershey herself “never wanted to be president. She got George and then she and George got me,” laughs Smith. “She was our guiding spirit, our Mother Superior. But no one wanted to spend a lot of time doing grunt work,” says Smith. The “grunt work,” apparently, was mostly done by women, many of them members of the Junior League, the garden clubs, and/or the League of Women Voters. In 1968 Hershey, Ada Grundy, and other women founded Citizens Who Care in an attempt to urge civic and business leaders to address Houston’s quality of life problems. In 1970 the organization’s founders formed the Citizens Environmental Coalition, an alliance of environmental organizations, which, among other activities, successfully persuaded hundreds of citizens to attend state air quality hearings. Hershey also created The Park People in 1979 to promote the creation of public parks. In 2009 The Park People would become part of the Houston Parks Board. Texans had formed the Lone Star chapter of the Sierra Club in 1965, and the Houston group was founded a few years later. The Houston chapter of the Audubon Society was founded in 1969, led by nature-lover Yramategui. Hershey became a national director of Audubon and persuaded Smith to join. But it was no easy matter to acquire title to the land on the bayou that Ginzbarg, Frank and Cab Smith (not related), and many others wanted to protect from development. The land was owned by the Friendswood Development Company, a subsidiary of the Humble Oil Company, which later became Exxon, and it had already been platted for residential development “right up to the banks of the bayou,” Smith says. Convincing Humble to sell the land required a tough negotiator. Fortunately the group had a famously tough negotiator in Jake Hershey, who had made a fortune creating the world’s largest commercial barge business. “Jake could sit across the table from the Humble people and persuade them that [development] was not a good idea,” recalls Smith. Humble decided it was a better idea to sell the land. The land was sold to Harris County using funds raised from Pasadena school children, local government agencies, and many others. Cab Smith became the first president of the Armand Bayou Nature Center in 1974, and Frank Smith was the second president. 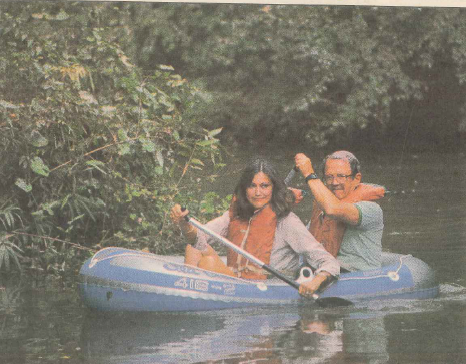 Frank Smith Jr. and Glenda Barrett, then president of The Park People, on Buffalo Bayou in a photo taken by Michael Boddy and published in the Houston Post, Jan. 27, 1985. The article was part of a series on Houston environmentalists by Post reporter Harold Scarlett. The creation and preservation of public parks became a lifelong calling for Smith. Ima Hogg was a Smith family friend who had donated the Hogg Family home, Bayou Bend, its gardens, furniture and art to the Museum of Fine Arts in 1957. The elegant house on the south bank of Buffalo Bayou had been designed by John Staub. Miss Ima, as she was known, kept a sharp lookout for inappropriate uses of Memorial Park, regularly writing letters to city mayors and parks superintendents to remind them that her family had made a considerable financial sacrifice to sell the 1,500 acres of land to the City at cost, and that the park was to remain natural, public, and with as little built structure as possible. Shortly before she died in 1975, Miss Ima felt she was no longer strong enough physically to inspect the park and protect it from inappropriate uses, like building the Astrodome there or George Brown’s plan to drill for oil there, or destroying some 30 acres of wooded parkland to create a new channel of Buffalo Bayou in order to protect private property on the south bank. She decided to form a watchdog committee to guard over the park. For that she turned to Frank Smith, whom she had known since he was a boy and to his good friend from elementary school, Dr. Jack Staub, a physician and noted amateur horticulturalist who had been president of the Arboretum and was the son of her architect; to Terry Hershey and Sadie Gwin Blackburn, and a representative of the League of Women Voters. In 2000 this Memorial Park Advisory Committee became today’s Memorial Park Conservancy. Within a few years, Smith, who was then the president of the Bayou Preservation Association, would serve as head of the Harris County Flood Control Citizens Advisory Task Force, the Rice Design Alliance, and the board of the Nature Conservancy of Texas. He is particularly proud of the Conservancy’s work, under the direction of Andrew Sansom (“one of the best hires I ever made,” says Smith) and in cooperation with the Texas Parks and Wildlife Department, in purchasing the land that would become Enchanted Rock State Natural Area and the 300,000-acre Big Bend Ranch State Park. During Smith’s tenure the Conservancy also acquired the 67,000-acre Harte Ranch, which would become part of Big Bend National Park and the 2,300 acres of ranch land that would become Honey Creek State Natural Area. 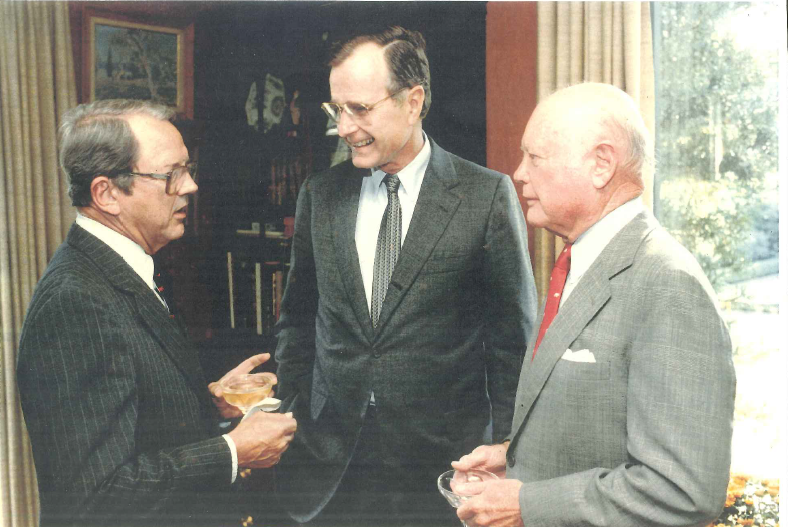 Smith, along with Jake Hershey, was also one of the original members of the Galveston Bay Foundation, organized by environmental attorney Jim Blackburn in 1987, and he continues to serve on its advisory board. In the 1990’s Smith moved to Colorado with his second wife, Katherine, the daughter of his longtime colleague Albert Fay, and distanced himself from civic affairs in Houston. He returned to Houston around 2004, and Terry Hershey persuaded him to return to the board of the BPA and take over her position as historian. In the meantime a new generation of community-based environmental advocacy groups had grown up. Some of these include Galveston Baykeeper, the Katy Prairie Conservancy, Texas Environmental Justice Advocacy Services, the Texas Health and Environment Alliance, the Houston Air Alliance, the Texas Campaign for the Environment, Houston Tomorrow, and Texans for Clean Water. In 2009 Smith received the Synergy Lifetime Achievement Award from the Citizens’ Environmental Coalition (CEC), a high point of his career. But complications had set in at the BPA and at the Memorial Park Conservancy. The BPA in 2010 under its board chairman Kevin Shanley, principal with the landscape architecture firm SWA Group, was proposing to raze, dredge, and reroute one of the last natural stretches of Buffalo Bayou as it passes by Memorial Park and the Hogg Bird Sanctuary. The idea of the project, described as “restoration” and erosion control and called the Memorial Park Demonstration Project, was ostensibly to demonstrate Natural Channel Design, a controversial system of river restoration developed by Dave Rosgen that was sweeping the country, including federal and state agencies. The well-respected Shanley, with the reputation of the BPA behind him, brought on the Harris County Flood Control District, which for more than fifty years had been longing to get its heavy equipment onto the banks of Buffalo Bayou. He also enlisted the River Oaks Country Club, which owns the entire south bank of the proposed project area. The club, then in the process of rebuilding its golf course, was having problems with areas of the high bank where over the years managers had cut down the thick forest that held the banks together and extended the mowed golf course up to the edge. “[Natural Channel Design] is a technology for restoring rivers that have been channelized,” says Smith of Rosgen’s methods. In fact, not even Dave Rosgen thought Dave Rosgen’s ideas should be used on that stretch of the river. The flood control district was planning to apply for a general permit from the Army Corps of Engineers that would allow them to move forward without even telling the public about their plans. But Smith, Greene, Evelyn Merz and Brandt Mannchen of the Houston Sierra Club, Olive Hershey, daughter of Jake Hershey, Cynthia Taylor, widow of architect Harwood Taylor, landscape architect Janet Wagner, Frank Salzhandler, Katy Emde, and others objected and began publicizing the threat to the bayou. 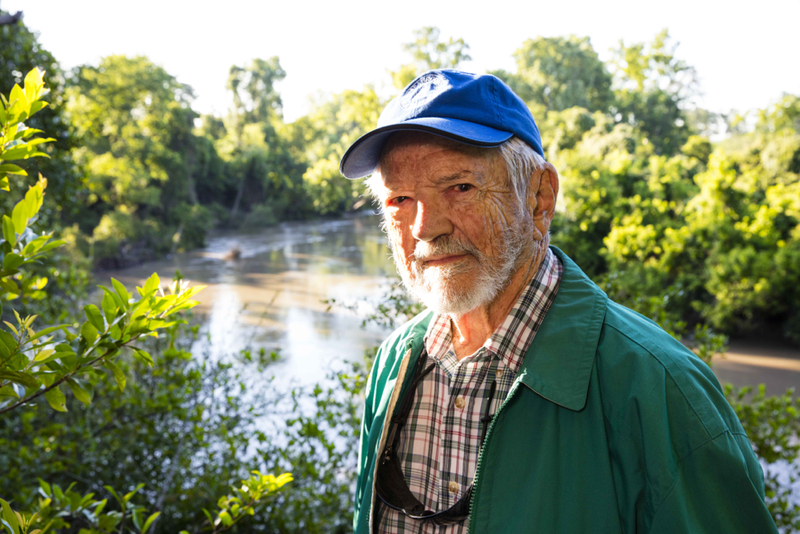 In the fall of 2014 Smith, Olive Hershey, Blaine Adams, a former member of the board of the Memorial Park Conservancy who lives on Buffalo Bayou, and Susan Chadwick, a writer who grew up on the bayou across the street from Smith, formed a new nonprofit organization to fight the project and preserve Buffalo Bayou. It is called Save Buffalo Bayou. As a result of their efforts and the many hundreds of people, including Merz, Mannchen, and other members of the Sierra Club who wrote to the Corps opposing the project, the Corps has so far not issued the permit required under the Clean Water Act. Frank Smith is now a remarkably vigorous ninety-five years old. He has sold the last of his airplanes, but he still carries his pilot’s license in his pocket. “I can fly legally, but I have the good sense not to,” he says. He still sails. He still drives fast convertibles. Slowly, he claims. Many of his friends and colleagues are gone, including Jake Hershey, who died in 2000. Others continue to fall by the wayside. But Smith stays involved and continues to fight for what he believes is right, including defending Memorial Park from landscaping plans that in his view violate the Hogg Family’s intention that the park remain as natural as possible. Smith attributes his vigor and good health to a lifetime of respecting the cocktail hour and driving with the top down. He and his sister, Avon Smith Duson, visit Terry Hershey regularly at the house on Buffalo Bayou where she still lives. Though “Sister,” as Smith calls her, was not initially interested in environmental issues, she began working for Hershey and “was swept up by Terry as I was,” says Smith. 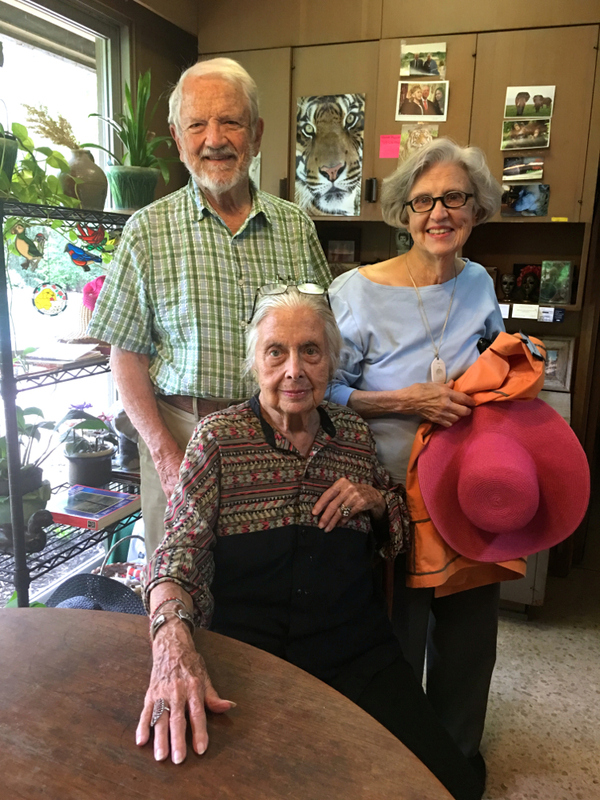 Frank Smith Jr. and his sister, Avon Smith Duson, with Terry Hershey, seated, at Hershey’s home in the spring of 2016. Knowing many of the interesting people, places and organizations since arriving in Houston in 1985, I was intrigued by this well-written article. Thank you and Frank Smith for enlightening the reader on the ever-evolving history of Houston’s conservation community, cultural and civic endeavors. Reading this certainly added to my knowledge of both “old” and “new” Houston. Thank You, Ann Hamilton, for all that you do. Everyone should be aware of the beautiful 750-acre nature preserve that you are working to protect out there in Sugar Land. A wonderful story about a lifetime of fascination and concern for the planet!! A remarkable gathering of concerned Houstonians to protect the Bayou. Thank you. God bless Frank Smith and all those who love nature as he does and do something about it. And, God bless our Bayou. Fascinating story. We owe Frank Smith and others like him a great debt. Beautifully documented history! We shout for the watchmen of the past and continue to cry out for the protection of Buffalo Bayou, our prairie, wetlands, and old growth forests. SENSATIONAL! IT PROVIDES SOME RARE “UNDER-THE-COVERS” FACTUAL EXAMPLES OF WHAT WE MUST CONTINUE TO CHALLENGE. An extraordinary story of an extraordinary person. Thank you Frank Smith for your many years of service to the public interest.